of breathtaking natural beauty, diverse recreational opportunities, and fascinating history. This journey can calm your heart, lift your spirit, and create wonderful memories. . ."
We started exploring the city and canyon area on Tuesday, the first day we arrived in Logan. We've barely begun to see everything there is to see, or do everything there is to do, in only five days, however. I have a long "to do" list for our second longer visit here in a little over a week. If you visit the area I highly recommend you get the Cache Valley Visitors Bureau's guides to the Cache Valley and Logan Canyon. Both are free, colorful, and full of detailed information about the area. We got both brochures at the Logan Ranger District Visitor Center on Hwy. 89 at the east edge of town near the canyon entrance. You can also get them at the Visitors' Bureau at 199 N. Main Street. Both locations have a variety of maps and other brochures that can help you maximize your visit to northeastern Utah. You can also browse through the canyon brochure online; that's where I got the picture above. Click on "31 Sites and Stops." "THIS IS THE RIGHT PLACE"
Utah is known for its many landmarks, both natural and historical. Spectacular mountains and dramatic rock features were formed over millions of years by cataclysmic upheavals of the earth and the erosion of wind and water. 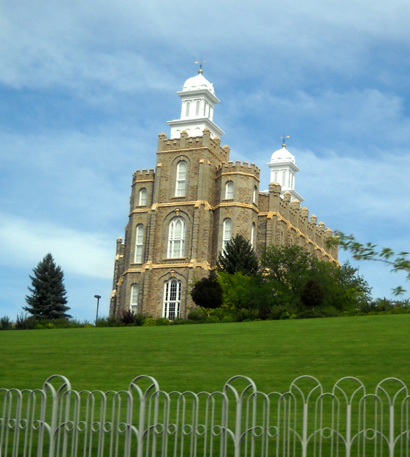 Stately man-made Mormon architecture built in the last two centuries also draws visitors and residents to the region. In the last entry I talked about "vast open spaces" in many western states, including Utah. Although the state is full of stunning scenery that makes for great vacation destinations, much of it is too arid to reasonably sustain human life. Fertile valleys with reliable water sources are fewer and farther between. 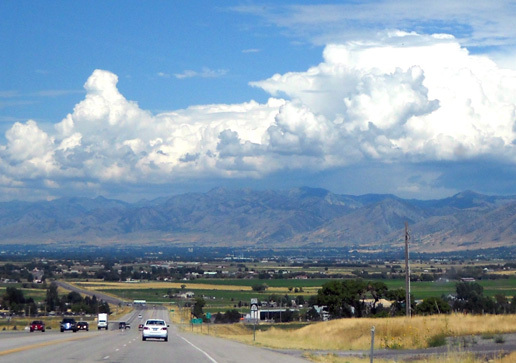 One of the best is the Cache Valley. Early Mormon pioneers seeking religious freedom discovered in the mid-1800s that with a lot of hard work, they could successfully farm the area north, east, and south of what is now Salt Lake City. Nobody else had permanently settled the mostly-arid land when Mormon leader Brigham Young first saw the Great Salt Lake Valley and proclaimed, "This is the right place" to establish a community where his followers could practice their religion free from persecution. The "Beehive State" earned its nickname because of their strong sense of community and hard work to transform the region into a productive agricultural area. Utah is literally the Mormon homeland. 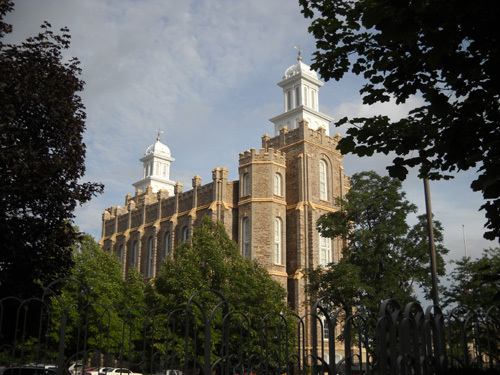 About 70% of the state's citizens are of the Mormon faith and the church continues to exert a strong influence on Utah's culture and traditions. Before Jim retired in 2004 we spent several years researching where we wanted to spend the rest of our lives. We had a short list of Very Important Requirements as far as weather, cost of living, medical facilities, recreational opportunities, and quality of life. We were able to find all kinds of data on the internet, but knew that our decision would eventually boil down to how an area "felt" to us when we spent some time there in person. 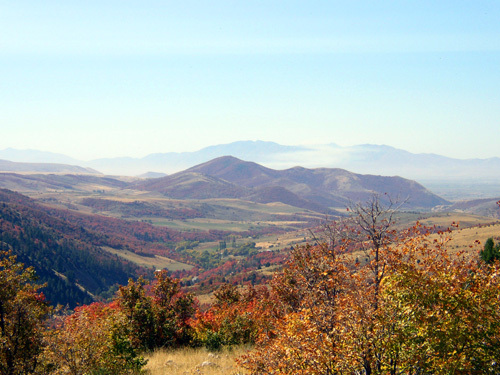 When we attended the Wasatch Front and Bear 100-mile races several times in the early 2000s we felt "at home" in the beautiful mountains and valleys east of I-15 from Heber City, UT to Preston, ID and considered retiring somewhere in the region. Mormon and non-Mormon friends who have lived in the area loved it, but warned us that non-Mormons are so out-numbered that they often have trouble integrating themselves into local communities. They apparently are forever considered "outsiders" if they aren't of the Mormon faith. That was a compelling reason for us to continue looking for another location to retire. Although it's perhaps not the "right place" for us to live, it hasn't kept us from enjoying visits to the area. The welcome has always been warm. Logan is an attractive, vibrant city that is located about 90 miles northeast of Salt Lake City in the fertile Cache (pronounced "Cash") Valley. Founded in 1866, it has grown from a small agricultural and mill community into a thriving, diverse business center with a population of about 50,000 people. The city prides itself on its high quality of life (cultural, educational, economic, recreational, and other opportunities) while maintaining a friendly, rural atmosphere. Logan is built on multiple terraces (plateaus) that remain from the ancient Lake Bonneville. It reminds me of the mesas and canyons of Los Alamos, NM in that regard, although Logan gets more rain and is much greener. During the last Ice Age, the Cache Valley (and beyond) was filled with a huge freshwater lake that was 348 miles long and 145 miles wide. Remains of 15,000-year-old wooly mammoths, musk oxen, camels, and prehistoric bison have been found along the ancient shoreline. The eastern side of Logan is quite hilly, with great views from the tops of these terraces. The western side of town is flatter. We aren't "shoppers" and we don't often eat out, so I can't tell you where to find interesting little shops and great restaurants in Logan. However, we drove enough of the major and residential streets to recommend other visitors tour the city by car to see the beautiful homes, parks, historic areas, and Utah State University campus. Even the commercial buildings on Main Street are interesting. Our focus this week has been mostly on running and hiking the trails up in the canyon but we have also been down in the town several times to shop for supplies, do laundry, make phone calls, get on the internet, check out camping at the fairgrounds, and generally nose around. Today while Jim was doing a long run on the Bear course, Cody and I spent some time on a historical walking tour downtown. 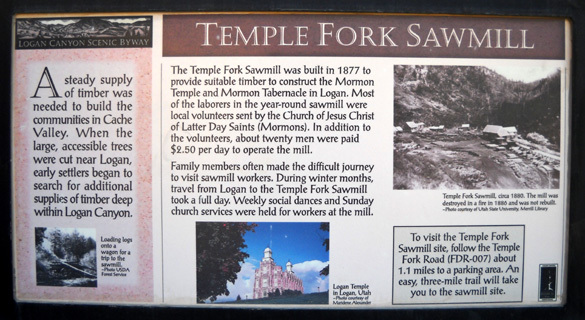 As happened in Salt Lake City about twenty years earlier, it wasn't long after Mormons discovered the Logan area, built irrigation canals off the Logan and Bear Rivers, planted their fields, and laid out city streets -- that they began building magnificent temples that continue to draw tourists to the region. 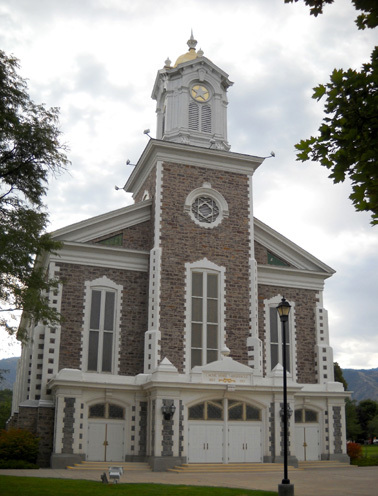 Two of the largest, most impressive structures in town are the Mormon Temple (next photo) and the Logan Tabernacle. I am a student of interesting architecture of all kinds of structures (museums, monuments, churches, houses, businesses, etc.) from all different periods and countries. 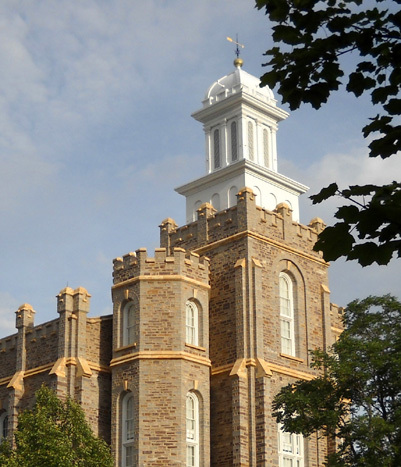 Some of the Mormon temples in Utah and other states remind me of stately European cathedrals. As an example, click on this link for a photo gallery of the Salt Lake Temple, reportedly the biggest tourist draw in Utah. 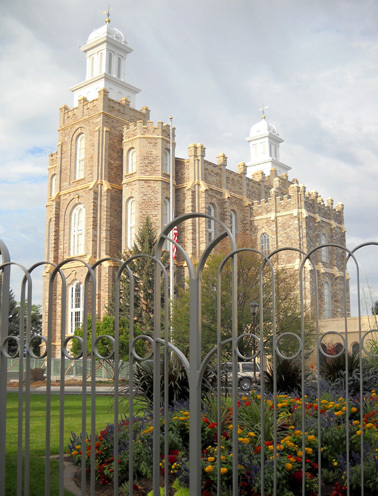 Logan doesn't have anything as impressive as Temple Square, but you can't drive through town without seeing the tall spires of both the temple and tabernacle. I wanted to see them up closer. Or maybe that's the back side? There's no door but this fa�ade is what you see first as you drive up the hill to the entrance, which is at the other end of the building on the high side of the hill. There is some construction near the entrance that doesn't make it particularly photogenic this summer. I'll be curious to see what it looks like when it's done. The modified Gothic structure is built with limestone and sandstone that was quarried locally. Due to current road construction on Temple Fork, we didn't drive or run back to the sawmill site. If the roadwork is done when we come back, I'd like to see what's left of it. The interior of the Temple is open to church members only. Although the attractive grounds are open to the public, I didn't venture inside the heavy decorative iron fencing because there were so many well-dressed people gathered in the annex next to the Temple and I was dressed in running clothes. I was a bit self-conscious about that, even "on the outside looking in!" This stately building IS open to the public Mondays through Saturdays during the summer but I haven't been in it yet. 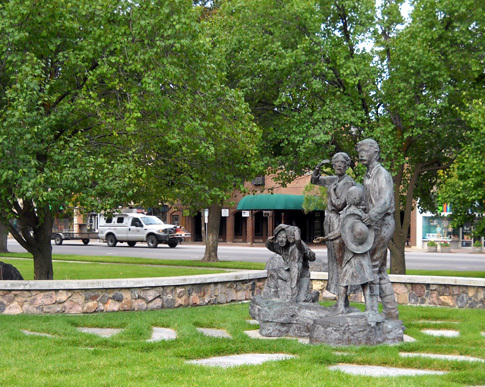 It is easy to find on Main Street between Center and 100 N.
Since it isn't fenced in and no one else was enjoying its pretty park-like setting, Cody and I strolled around the partly-shaded grounds admiring the sculptures and architecture. 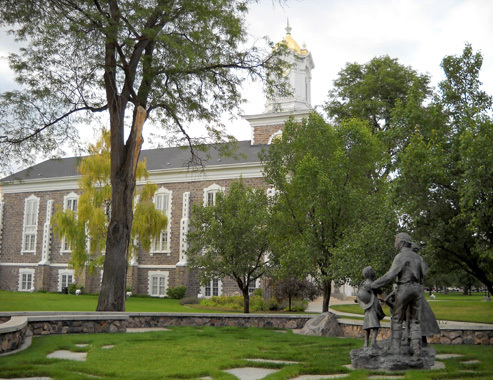 Completed in 1891, the Tabernacle is considered to be a striking example of an early Mormon pioneer public meetinghouse. It is used for church conferences, community concerts, and other presentations. A popular feature is the Family History Center located in the basement, said to be the largest genealogical library in the world. Volunteers assist people from all over the world to research their family history with the help of everything from old manuscripts to modern computers.. Although we've driven through part of the university, I haven't taken any photos there yet. It also has some beautiful historical buildings. When we return I also want to check out one or more of the nine local museums described in the Visitors Bureau brochure. 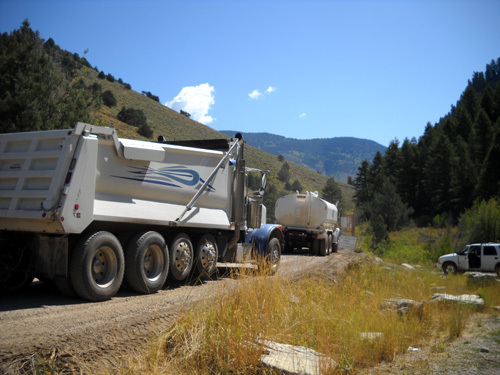 Now let's explore some of the more natural landmarks in Logan Canyon. OK, OK, I realize the roads and structures through the canyon are man-made! But they wouldn't be there if the interesting natural features weren't formed first. 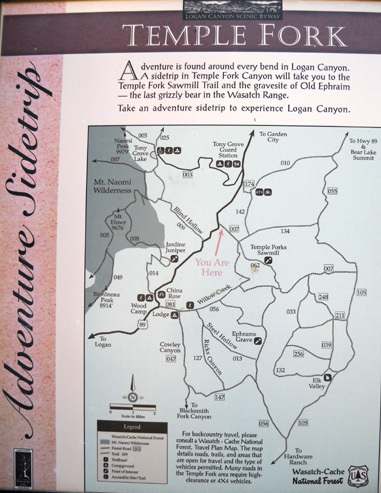 The Cache Valley Visitors Bureau has several maps and brochures with a goldmine of information about the canyon and extensive Wasatch-Cache National Forest area that surrounds it. 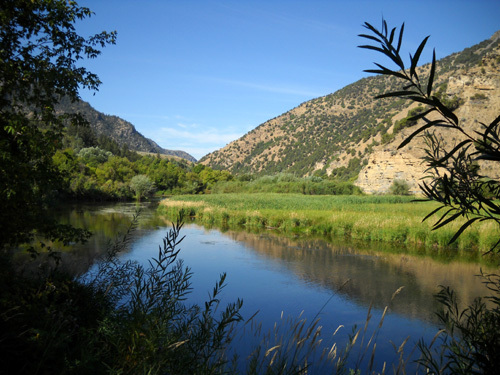 Besides all the things to do and see along the 41-mile long Logan Canyon National Scenic Byway (US Hwy. 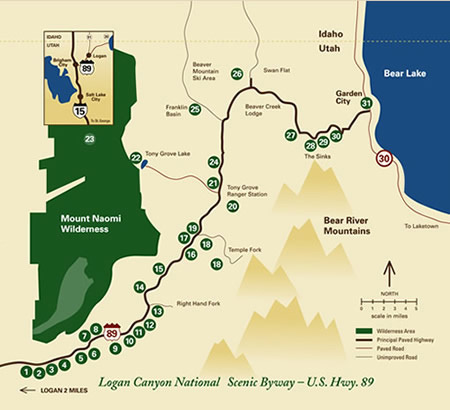 89) between Logan and Garden City, there are hundreds of miles of forest service roads and trails to explore by foot, bicycle, horse, or motorized vehicle. Sign at Temple Fork Road showing the major back-country roads along the scenic byway. This is a popular recreational area all four seasons of the year: hiking, running, road and trail cycling, swimming, climbing, horseback riding, camping and back-packing, boating, fishing, hunting, wildlife and bird-watching, photography, riding ATVs and various 4WD vehicles on the forest service roads, and winter sports like cross-country and downhill skiing, snowshoeing, snowboarding, and snowmobiling. 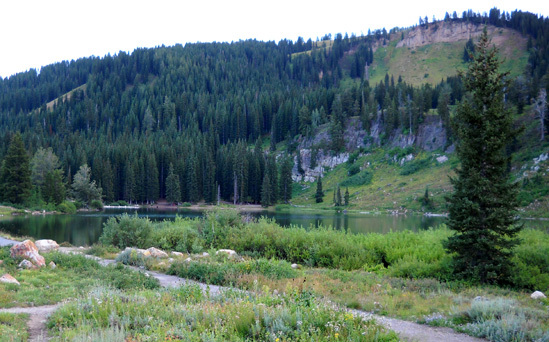 and the Bear Lake Overlook and rest area. I don't have photos of most of these landmarks yet; you can see some of them at the link above. AN HOUR OR A LIFETIME? 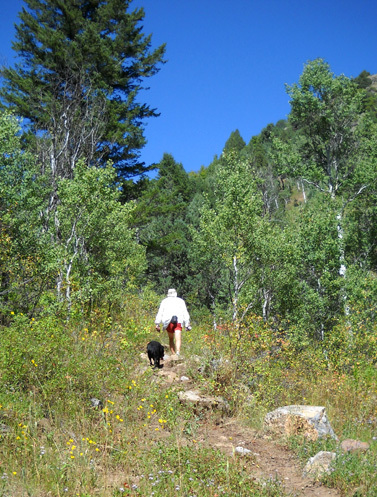 There are many ways to enjoy Logan Canyon, depending on how much time you have. You could enjoy the canyon's scenery by spending an hour driving up or down the scenic byway and never get out of your car. You could spend a day and get out to see a few of the landmarks close to the road. You could spend a week and see many of the features listed above, as well as explore some of the roads and trails. Or, if you're like us, you need a lot more time than that to see it all! We didn't try to cram it all in because we know we'll be back soon. So far we have driven through most of the nine or ten campgrounds and ruled out all but two of them to accommodate our camper; Guinavah and Sunrise have a few sites each that are suitable for Class As and Class Cs, trailers, and 5th wheels that are over 20 feet in length. We've driven or run by all three of the dams and have checked out several trails. Jim and Cody hike up the trail in Blind Hollow, part of the Bear 100 course. We spotted part of the old Dugway. 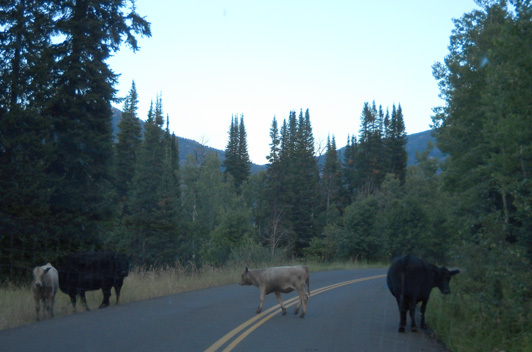 We've run or walked around Tony Grove Lake, location of one of the Bear 100s aid stations, and dodged some free-range cattle one evening on the side road to reach it:. There are many things left to see and do along the scenic byway. On Monday as we head toward the Tetons we'll see the upper part of the canyon between Tony Grove Rec Area and Garden City, including the wilderness area, Franklin Basin, and the Bear Lake Overlook. We'll also try to find where the Bear 100 finishes in Garden City.